I hear from couples that they are sometimes concerned about how young children invited to their wedding will behave. This book would make a great gift for your little guests. 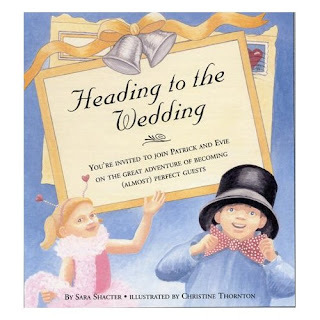 Sara F. Shacter has published a wonderful children's Heading to the Wedding written to educate young children about what a wedding is like and how to behave. The book centers around a young boy and girl who think of gatherings as parties where they can dress up and have fun. But they learn how to enjoy themselves and respect the special day of the bride and groom. The book also includes a glossary of wedding words.